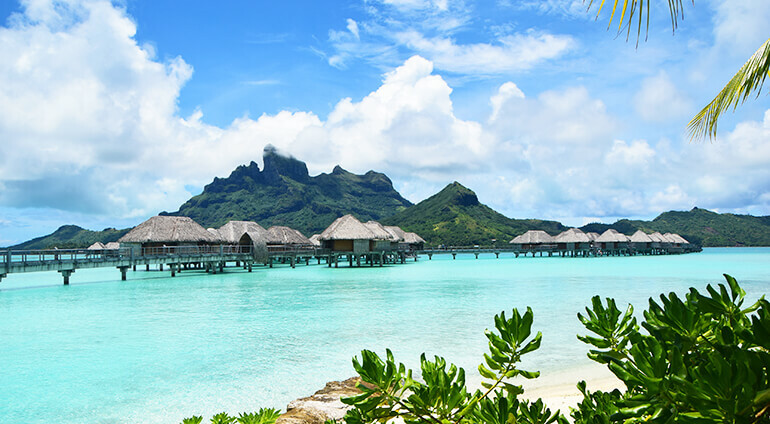 Choose to spend your time switching off in a hammock, being wined and dined, or head out on an adventure in Bora Bora. Whether you prefer to sunbathe or go out exploring, this locale will have something to offer. If you are on a special holiday, book a private helicopter ride or champagne tour. For active travellers there’s an endless selection of water based activities including canoeing, jet skiing, kitesurfing, fishing and paddle boarding. After a long day of action packed activities, soothe your muscles and switch off at one of the islands spas. You can’t go to Bora Bora without doing some snorkelling, there’s breath-taking coral gardens with all sorts of marine life. See eels, sharks, manta rays and colourful tropical fish such as clownfish. If you fancy a challenging walk, climb to the top of Mount Otemanu for some spectacular views. If you are brave enough, go shark diving with black tip reef sharks and watch sting rays being fed by hand. There are a few lovely beaches on the island, including Matira beach which is lined with coconut palms and boasts clear, shallow waters.